Galle CC skipper Lasith Malinga celebrates a wicket on his way to an impressive seven-wicket haul against Kandy who were shot out for 99 on the first day of the Super Four provincial limited-over tournament match at Pallekele Stadium yesterday. 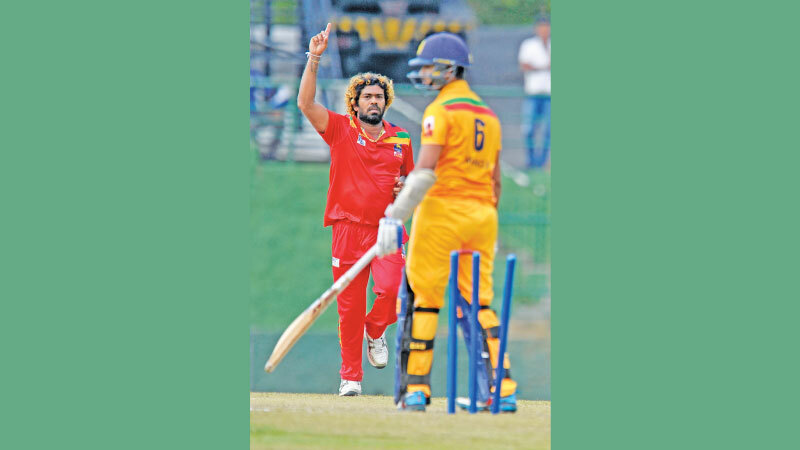 Sri Lanka fast bowler Lasith Malinga was in devastating form for Galle on the opening day of the Super Four provincial limited-over tournament match against Kandy at Pallekele less than 12 hours after bowling Mumbai Indians to a 37-run win over Chennai Super Kings in the IPL match at Mumbai. Malinga who took 3 wickets for 34 for Mumbai Indians, carried that form to Pallekele where he ran through the Kandy batting for 99 finishing with impressive figures of seven wickets for 49 to lead his team to a comprehensive win by 156 runs. Galle rode on Kusal Mendis’ well paced knock of 65 off 87 balls to notch up the highest total of the day 255 in 50 overs. Sandun Weerakkody also contributed with a 63-ball half century. Kandy’s batting was devastated by Malinga who took the top five wickets to reduce Kandy to 40-5, a position from which they never recovered. The only batsman to offer any resistance was Kandy skipper and Sri Lanka Test opener Dimuth Karunaratne who carried his bat out for 35 not out off 48 balls as he saw his team crumble in 18.5 overs. In the other match played at Dambulla, a late assault on the bowling by Chamika Karunaratne who hit a quickfire 57 off 53 balls inclusive of four fours and two sixes enabled Colombo to recover from 152-6 to total 238-9 off their 50 overs. Asitha Fernando contributed a half century off 53 balls and veteran leg-spinner Jeevan Mendis captured four wickets for 36. Dambulla in reply fared poorly to be put out for 156 with no batsman crossing 40. This tournament is being used by the national selectors to pick Sri Lanka’s 15-man squad for the World Cup. Judging by the first day’s turn of events there was not much they would have gained from the batting point as all four teams failed to top the 300-run mark which is the basic requirement in contemporary one-day cricket today. n At Dambulla: Colombo beat Dambulla by 82 runs. n At Pallekele: Galle beat Kandy by 156 runs.